An experiment is conducted to study the change of state of iodine. Some powder of solid iodine is heated as shown in the Figure above, the black solid iodine changes into a purple gas at 125°C. 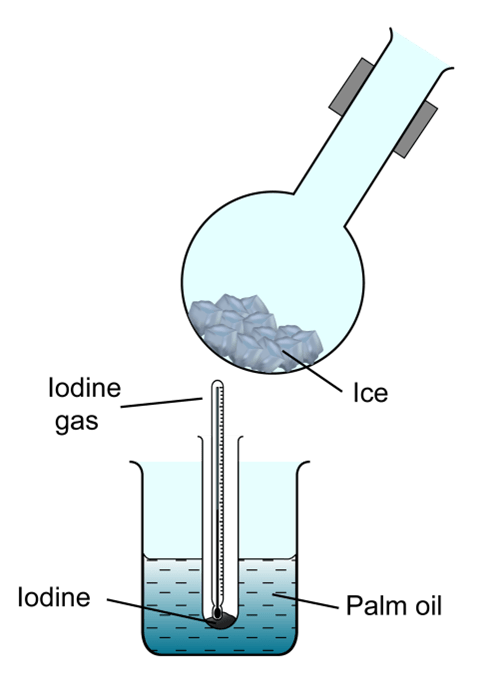 The purple gas is then cooled by a round bottom flask that fill with ice. State the process of change of state demonstrated by iodine at 125°C. What can be observed at part R? Some black powder form at the bottom of the flask. What is the name of the process when iodine gas turns into iodine solid again? Explain why palm oil is used in the experiment instead of water. Because iodine sublime at 125°C, the temperature which is higher than the boiling point of water. Name two other substances which also sublime at atmospheric pressure (1atm). Ammonium chloride, carbon dioxide, naphthalene.